0:51 What is the Business Leaders’ Health and Safety Forum? 1:47 Why was it established? 5:34 How will this Supply Chain project affect me? 12:10 What are the possible measures? Tony: Gidday listeners, Tony Collins back with Julian Hughes who is the Executive Director of the Business Leaders’ Health and Safety Forum. I’ll ask Julian about the Forum in a moment and I’m sure he’ll correct me if I’m wrong. But basically to my mind the Forums is about working with CEO of major a business to influence and improve Health and Safety performance. And today we’ll talk about how this could affect you and your business. So, welcome Julian. Julian: Thank you, good to be here. Tony: So can you tell me a little bit about the Forum to kick this off. Julian: Well you’re right, the Forum was established with the intention of improving safety performance by engaging and improving the effectiveness of Senior leaders. And when you think of leaders in a business, the most important id the CEO or the equivalent whatever that role may be for a NZ based business. I guess our members are made up CEO, Managers Directors, General Managers and it really depends upon the company structure. But that’s essentially the idea, is that senior leaders have a huge role to play. They set the tone and can create positive safety cultures and we felt we could provide a mechanism and an avenue for them to improve their safety knowledge and understanding so that they can become more effective safety leaders themselves. Tony: Great, so why was the forum established. Julian: That’s an interesting idea in where did it come from. It’s origins were in 2009, and to give credit to the Ex-Minister of Labour, the Honorable Kate Wilkonson, she lead a number of discussion with CEO in that year, and essentially asked them a question, or two questions. One is our safety performance acceptable, and the short answer is no it’s not. And do CEO of New Zealand businesses have a role to play in improving that. And there were a couple of forums and meetings and at the end of it there was enough momentum and enough CEO who said of course we have a role to play. We’re not sure quite what that looks like but we have a role to play in improving that. So cut forward a year to June 2010 and the forum was officially launched. It was launched by the Prime Minister in Auckland and about 100 CEO of New Zealand businesses signed up to the forum’s pledge. So essentially they came together with a common vision of what they believe their role should be in leading Health and Safety in their businesses. Tony: And fast forward to 2013, I know there are a number of different work streams and projects underway, and the one I thought most relevant to talk about today is how the forum, which represents a number of large businesses, aim to encourage contractor or subcontractor to improve H&S through the supply chain. Can you explain a little about this supply chain project and actually, what does the supply chain mean? Julian: I’ll just rewind slightly before I answer that. The key change that happened between 2010 and 2013 was that the forum set itself up as a membership organsiation, so we’re now a not-for-profit incorporated society and we have approximately 140 CEO who are our members. And that provides a slight change from 2010 where we have a revenue stream, which means we can now do some work. The work we are doing is some of those projects you described. So then to talk about the supply chain project. I guess the idea of the forum was to improve safety across the New Zealand economy. Not just for the forum members who sign up but there was a greater good concept, could CEO influence others to improve health and safety performance right across our economy. And there are a couple of ways we thought of how we can actually do that. One is to get every business leader in the country to sign up and I think we’d still welcome that approach. But we actually thought the way the forum could be most influential would be how could forum members influence other businesses through their supply chain. So we signed up or we approach leaders from large New Zealand businesses, as opposed to small to medium sized, or those businesses that have a particular high risk. And then we said for you, you often interact with a lot of other companies, to manage your business. In some cases you purchase good and services or contract people in to work in some areas of your business. In some areas you actually contract out large chunks of it. So one of the concerns in that whole arrangement is if you contract out a piece of work or you bring contractors in and you delegate health and safety responsibilities, the concern is if those companies don’t share your values, views and approach to health and safety, then you won’t have great performance. So our view was could we get CEO to understand what it is, what are the things they need to do to ensure safety performance is not only important to their business but also important to all the business they interact with. So we use that concept of the supply chain. We’re using it in a reasonably broad sense but in many ways what we are talking about is the health and safety performance between a business and it’s contractors. Tony: What that means then if I am a business or a contractor supplying goods and services to a larger business. What does that mean for me? 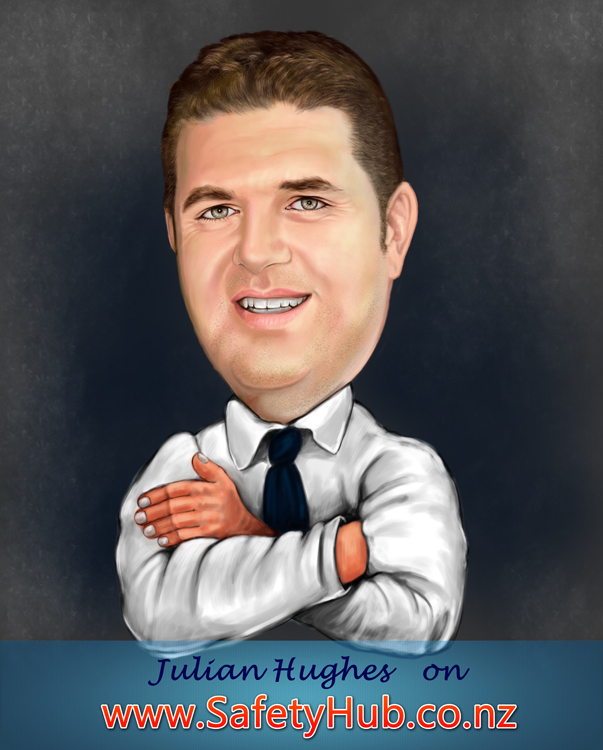 Julian: Well lots of businesses will already be experiencing what we are trying to promote in this space, and that is a company purchasing good and services puts in place an expectation of what they expect that company to be able to provide and they’ll often do that in the negotiation phase of tendering for a piece of work. They’ll potentially have requirements that companies will have to come up to. But there is also a range of other steps that we now know from research and experience that is required to ensure that it’s not only assessed prior to awarding the contract but there is an ongoing assessment and engagement with the contractor, to make sure the company contracting the work out is confident they company is maintaining the deal, basically, what they set up to start with. And that is kind of a relatively easy concept to understand and there are some intricacies within that relationship and how you do that, which are not always easy to do. Clearly there is an understanding that they are separate companies and that there is a contractual arrangement between those companies and so there needs to be a level of understanding, particularly at the leadership level about how that relationship works. So what we want to uncover in our project is what are the leadership behaviours and leadership values that promote the best performance within that contracting environment. And we think there are some really fantastic examples out there that is happening and what we’re really trying to do in uncover those and then find out how people are going and then promote others to adopt those practices. Sort of like here’s the best practice model that we know works out there in the business and recommend you having a look at this model. Is that the sort of approach? Tony: Sorry, who is Lawrence Waterman? Julian: Lawrence was the head of Health and Safety for the Olympic Delivery Authority and they were the organisaiton charged I guess delivering the Olympic Games facilities in London. And they’ve got a fantastic story to tell. It was the first Olympic build in modern times when no one was killed, in the construction phase. And they had an injury rate that was lower than the UK industry level. So they were working in a high risk, high-pressure environment and they did not kill anyone and they had a lower injury rate than the rest of the economy. Julian: Well I think that’s the story and without trying to paraphrase Lawrence’s story and that’s one of the reasons we wanted to understand what they did because we’d heard this great story that was unfolding. And to cut to our example, Christchurch Rebuild in many ways has some parallels. It’s a very different type of project and arguably much more complex, but there are some principles that we thought the London build uncovered which were equally relevant in the Christchurch Rebuild and then clearly equally relevant in any contractual arrangement. And what was interesting about what Lawrence said was the leadership that was required to deliver that result was strong from day one and right the way the project. But it wasn’t just about the Directors or the CEO of the authority running around saying that they were committed to safety. It actually translated into real tangible things they did on a day to day to basis. So, we think there is plenty to learn from that and that’s why we hosted him and have got a project team and are looking at those things that happened in London, what’s potentially happening in Christchurch and what else the research and experience tells us works. Tony: Sure, so with this commitment of Directors and CEO to influencing the supply chain, the aim is to increase the performance of those contractors or businesses that potentially are supplying or working for them. Julian: Absolutely, so it’s to say we believe the mindset. If a business leader has a mindset that the work they contract out is an extension of their business, then we think suddenly we are in the right frame of mind, we are in the ball park. So, how would that translate, what would that mean? Well it might mean they measure safety performance of their own business, but they use the same measures to measure the safety performance of their contractors. And that’s not always the case. In some cases it is but it is not always the case. So, it’s not just about saying I’d like them to be good, there are some tangible things you might start doing. You’ll be asking them to report on those things. You might have ongoing engagement meetings with them, at a senior level, asking how they’re going, what they are doing. Anyhow, we’ve seen some fantastic examples of this. Mike Bennett’s who is the CEO of Z Energy hosted a peer learning event for the forum late last year. And one of the key stories was when they were rebranding from the Shell Service stations to the Z service stations. There was a period where they didn’t have any incidents, they didn’t have any injury but there was a period where they were concerned about how the contractors were working at height in a couple of projects that were going on. And because of those concerns Mike actually closed the contract down for a period of time until he was satisfied they could do that [satisfy concerns]. And that was a tough call; they were under lots of pressure to deliver in a certain timeframe. Stopping a project is never helpful to anyone, generally, but what that shows you is safety is absolutely, when talking about top priority, it was the top priority and as the leader of Z Energy he wanted to make sure he could do that work safely and the contractors are working safely. So that sends a very strong message and when they were satisfied things were back on track, the project started. And I don’t know the detail but by all accounts it sounds like they delivered on time and on budget and that the impact suddenly derail the project. In fact, it sent pretty strong messages about what was expected. Tony: Is there a timeline to the launch of this project or a gradual emphasis and agreement across Directors and CEO to aim to affect the supply chain. Julian: Well, we want to deliver things and we have delivered stuff to date. So we’ve delivered around a couple of other projects around what we believe safety leadership is and we’ve got assessment tolls around that. We’re in the process of developing a safety leadership development process for CEO so, we’re about doing stuff, nit just sitting around and talking about it. But I guess to answer your question, we see this as a rolling set of deliverables. It’s not going to be all suddenly delivered on one day. I think what we’ll try and establish up front is what are the key principles that CEO need to aspire to or have to ensure that health and safety performances are emphasized through their supply chain. We’ll then attempt to engage CEO to ensure that they are espousing to those principles or have those principles in place. We will then try and help them try to understand how they can deliver on those things. But ultimately where we won’t be, I should be careful, but my feeling is we won’t be saying, this is the way you have to do it. And everyone follows the same process. I don’t think that’s what we’re doing because I don’t think – I think that could be counter productive. You know, different businesses are at different stages, they have different ways of doing things, so what we want them to do is take a principled approach but then apply it within their business and how that makes best sense to them and their suppliers. So, I hope that answers your question and I think we’ve made some good progress to date. We are a little bit behind where we want to be. And I think we will be having a rolling set of deliverable actions between now and the middle of 2014. Tony: Is there anything else that you’d like to add on this or have I not asked you anything you’d like to add to the conversation? Julian: Just the fact that the forum presents a fantastic opportunity for New Zealand to improve Health and Safety performance but it is, at this stage, an opportunity. And we need to embrace it and do what we can with it. It certainly provides that opportunity for CEO to engage with other who are facing very similar challenges, share their knowledge, understand how they can improve. And how they can be part of the health and safety conversation. One of the concerns I guess I’ve had, as someone who has worked in this area for some time, is that the people that can often make the most or have the most influence about health and safety performance haven’t always actually been the people involved in the conversation and influencing outcomes. And so we think we have a role to play there as well. And we are particularly proud our involvement with the taskforce review and the fact that our Chair, Rob Jager was asked to Chair the Taskforce Review, and so suddenly we had a large significant review, often referred to as a once in a generation review of our health and safety system, which had input from people who are dealing with these issues on a daily basis. And who are providing strong leadership within their business. So, we think there is a role we can play in that space as well. But we are very encouraged by where we are so far, and like many things there is a long way for us to go. Tony: And Julian if people want to find out more about the Business Leader’s Health and Safety Forum, how do they go about doing that? Julian: We have a website www.zeroharm.org.nz so feel free to check that out. And feel free to give me a call or contact me on my email. My email address and phone number is on the website. So more then happy to chat with anyone about what we’re doing. I said at the start that the target audience was large or high-risk businesses. We don’t actually have a criteria. If there is someone out there who is running a business and wants to understand how they can get better, or are leading a business sorry and wants to get better, absolutely give me a call. There is no reason why you can’t be part of the forum. We have some of New Zealand’s largest businesses engaged and we have even have some reasonably smaller businesses involved as well. So there are no criteria, give us a call, we’ll welcome all comers at this stage. Tony: Great, thank you Julian for coming in and sharing your knowledge and might catch up with you another time. PS Sign Up to the newsletter to get latest updates when they are released.